How Do You Factor the Greatest Common Factor out of a Polynomial? Factoring out the greatest common factor of a polynomial can be an important part of simplifying an expression. 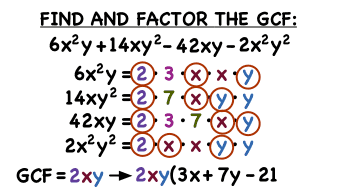 In this tutorial, you get step-by-step instructions on how to identify and factor out the greatest common factor. How Do You Find the Factors of a Monomial? In this tutorial, follow along as a monomial is written in factored form. This is information may come in handy if you ever need to simplify an expression involving monomials. Better check it out! How Do You Use a Polynomial Equation to Solve a Word Problem? Word problems let you see math in the real world! In this tutorial, see how to write an equation from a diagram to help find the perimeter of a bedroom. Take a look! How Do You Use a Solve a Polynomial Equation With Two Variables? Got an equation with polynomials involving multiple variables on both sides? You can factor out the greatest common factor, then factor by grouping, and then use the zero-product property to solve. Follow along with this tutorial to see a step-by-step explanation!